Fancy-ful Designs is a way for me to feature album art, book covers, or just awesome fan-art that I think deserves some recognition. 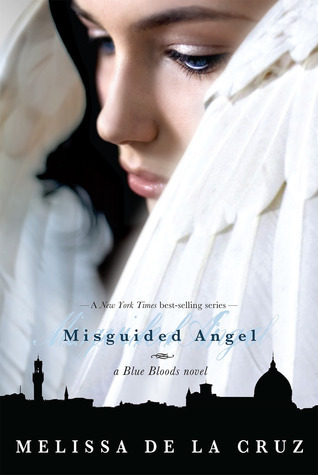 This weeks feature is Misguided Angel by Melissa de la Cruz. I have been an avid fan of the Blue Blood series since it first came out. I'm always excited for the next book because I think it's the final one, and yet each time I am thrilled and horrified to discover that there is more to come! Clearly there's nothing much to say synopsis wise. Obviously it's about Jack and Schuyler and their romantic escapades and mission to check the rest of the Gates so Lucifer cannot come through. But enough of the story, onto the cover! Can you say GORGEOUS! It's so sensual and soft and just pretty! Usually I don't like main characters being represented on the cover. I like to imagine how they look myself, but I think the cover model is a highly accurate representation of Schuyler. (Or at least I'm assuming it's Schuyler.) And the wings! Can I say pretty enough times to get the message across? I always love guessing the city skyline as well. I'm usually pretty good at it, and it's normally pretty obvious. This time however, I just cannot guess it! The only cities I can think of that have dome shaped buildings is Vatican City and Moscow! I'm not really feeling Moscow, but hey who knows? Anybody recognize the skyline, because it's driving me crazy!!!! (On a complete tangent here, quick apology.) So between work, more work, a local cover re-design contest, an all day mural painting for art, two tests, a take home test, and make up work I had absolutely NO time to update my blog. Trust me, it killed me inside. Sleep deprivation may also have a contributing factor... less than 7 hours of sleep in 48 hours.... not fun. So I apologize ahead of time for the flood of updates that is to come in all y'alls Blogger updates.